I have been keeping close to home with my last few posts. With that in mind I decided a quick fifteen-minute highway drive to a waterfall that feeds a creek running through the small town of Chase would still fill that objective. I try to visit that local falls for a few pictures every season and this past week was the first time I ventured there since I trudged to those falls through the deep snows last February. On that excursion to the falls the deep snowy path was untouched except for small footprints made by some lonely racoon. This time there had been lots of people evidenced by discarded hamburger wrappers, plastic cups and the scattered remains of a styrofoam carton. There was lots of spring water coming over the falls and by the looks of all the huge logs, boulders and the dangerously eroded path, it’s obvious that the early June melt must have produced a torrential flood of water in the small creek. As with last February, I asked my photographer pal, Jo, to accompany me. She had remembered our last Chase falls adventure and mounted a 24-105mm on her camera while I had my trusty 24-70mm on mine. Like that cold winter day it was cloudy and flat with just a bit of sun poking through to lighten up the forested creak a bit. Fortunately it was not enough to create shadows, although at times there were highlights on protruding rocks, tree limbs and the churning water. I chose the day because of the slight overcast. On a bright day one will struggle with overexposure on the white, reflective waterfall. As I wrote in February, I prefer a slight overcast or a foggy day. Bright sun and deep shadows create too much contrast. With our cameras tightly secured to tripods we set our lenses to apertures that would give us plenty of depth of field. Selected shutterspeeds over two minutes and placed neutral density filters in front of our lenses to reduce the amount of light so our slow shutterspeeds wouldn’t overexpose the scene. We set and used the camera’s self-timer so as to reduce camera shake and started taking pictures from every angle we could get to. That meant a lot of climbing over the jumble of large stones. 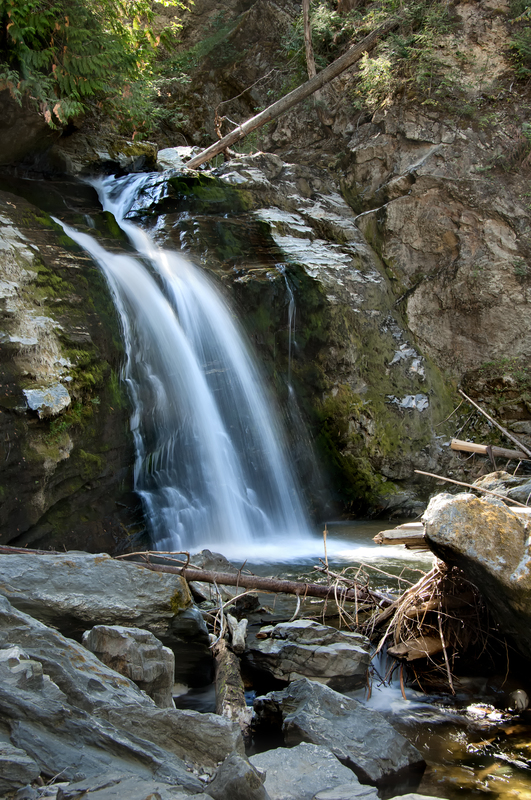 Photographing waterfalls are easy and no special talent or equipment is needed. I use a DSLR, tripod and ND filters. There’s nothing that most serious scenic photographers won’t already have. We had a great time and I will absolutely be back in another month or two. I like to photograph that little waterfall with my infrared converted camera. July and August will be perfect for that. I’ll also be back in September or October when the volume of water is dramatically decreased. Then winter, and everything starts over again. Photography is like that to me, and pointing my camera at the same subjects over and over year after year is just plain fun. This past month I have been sticking close to home. However, I plan to go a bit further from home now that summer is here. My goal, no matter where I am or what the subject is, is the enjoyment of making photographs. I suppose it’s as simple as that. The week had been a busy one for me. Unfortunately none of what occupied me had anything to do with photography. It is said that life gets in the way of having fun. So when I finally was able to chisel out some time for myself this last weekend I decided to travel the short distance up the road from my home to a stream with waterfall. 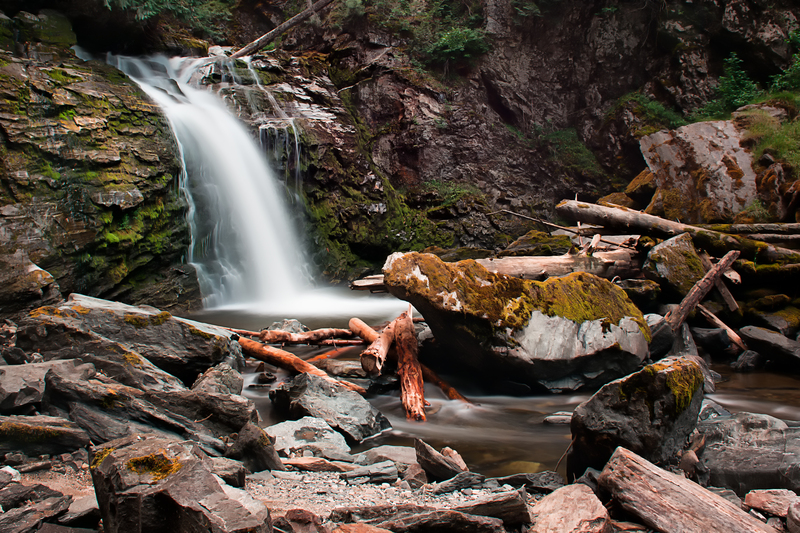 The falls are just off the Trans Canada Highway as it winds past Chase, BC. I brought along my tripod, selected my versatile 18-200mm lens, a polarizing filter, and a neutral density filter just in case there was lots of bright light, and headed out. When I arrived at the creek and walked along the well-worn path beside the rock-strewn creek up to the waterfall I found there was open shade everywhere. It was just before noon, and the sun’s direction against the large flat rocks that lined the narrow canyon was providing lots of soft, reflective light on the cliffs, the water, and the pile of logs that surrounded the falls left over from the flooding of waterways that occurred in British Columbia this spring. I don’t think I could have asked for better light. There was very little of the harsh sunlight I had anticipated so I didn’t have to use the neutral density filter, and because of all the soft reflected light I didn’t have deep shadows to contend with either. 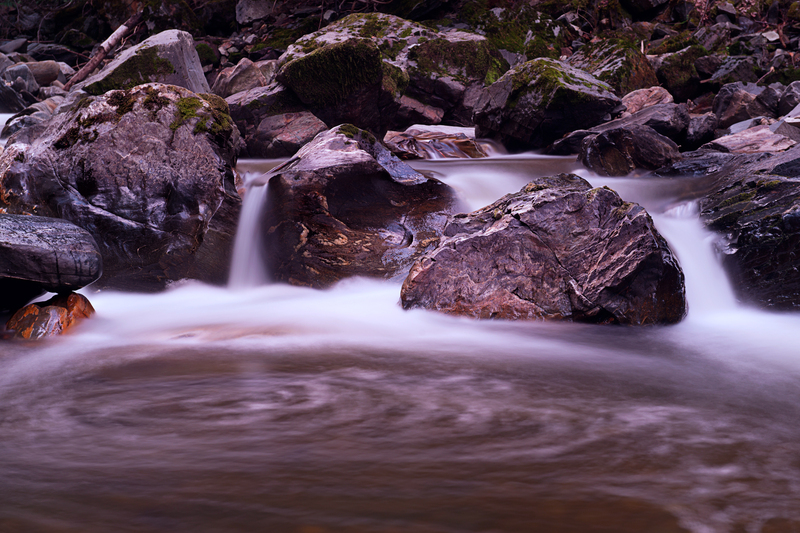 I climbed down the large rocks to the stream just below the falls, set up my tripod and started shooting. I like the soft look of water that a long shutterspeed creates so I began by putting the polarizer on the lens, which reduced the light by about two stops. Then I set the ISO to 100 and stopped the lens down to F/11. That gave me a shutterspeed of three seconds. Photographing water is fun. I enjoy waterfalls, but rushing streams or rivers, plant covered ponds, and mountain lakes are just as enticing. I think it’s how the water sculpts everything that surrounds it. Waterfalls usually demand a wide-angle lens and a tripod. A wide angle allows photographers to capture the landscape that contains a waterfall and the tripod means there won’t be camera shake. 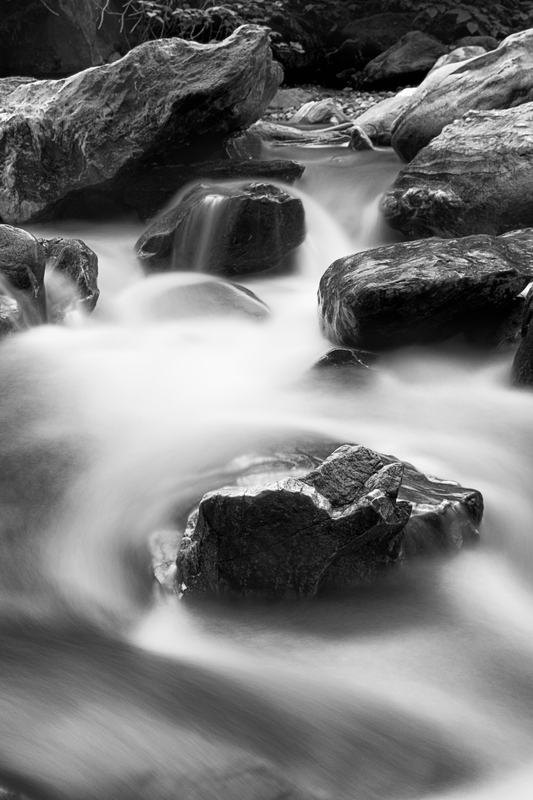 The lens doesn’t need to have a wide aperture because in landscape photography, and that include a landscape with a water feature like a waterfall, one should be stopping the aperture down to create as much depth of field as possible. The important thing, if one wants that glowing, soft looking water is a slow shutterspeed. And when the shutter is slowed the aperture must be closed, and with a smaller aperture comes more depth of field. I will also mention that a cable release is a good idea to reduce camera shake, but I seem to always forget mine, and so I use the camera’s self-timer instead. For those who live in the British Columbia there is no shortage of waterfalls that are easy to photograph, and for many like me the waterfalls are only minutes away. Small falls like the one I go to certainly don’t match some of the spectacular waterfalls from around the world, but even tiny falls make good pictures if the photographer gets creative enough. I even have a picture hanging on a wall in my home that shows a waterfall of only four feet high. I put my camera on one of those little pocket tripods and got a very wet knee, shoulder, and hair taking that picture, and remember laughing at the contortions I was assuming to keep from getting too wet in that cold water. Now that would have been a good picture. But, as I wrote, water is fun to photograph and getting wet on occasion is worth the final picture I suppose. Someday I might get the chance to travel around British Columbia, or North America to photograph some of the magnificent waterfalls, but until then I’ll just make the ten-minute drive up the road. And I always appreciate your comments.